International manufacturer of paint and coatings based in Minneapolis, Minnesota, U.S., Valspar promotes its Valspar Signature Interior Paint in a new commercial, aimed at highlighting that, with thousands of colors you can afford, this paint makes it easy to change the look of your home whenever you like. 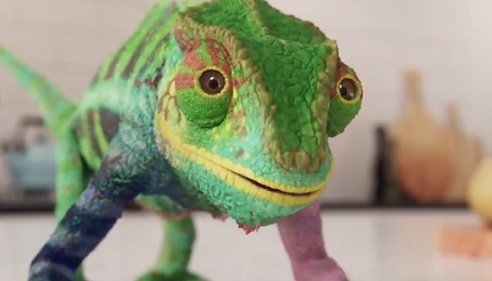 The 30-second spot features a living room which gets a new vibe as various Valspar paint colors are selected by a chameleon, the brand’s mascot. The chosen hues, available at Lowe’s stores, are Simply Peach 2004-2B, Luna 5005-3A, Ivory Lace 7003-6, Garden Pool 5003-10C, Shaded Lake 5011-9, Fiesta Blue 5003-10A, Swim 5006-8A, Artisan Green 5009-7, Imperial Lilac 4003-9C, Aqua Glow 5007-9B, Purple Whisper 4002-9C, and Magic Wand 1001-2A. The song used in the ad is “Perfect Combination” by HAEL, which was written by Leah Nobel and Alexi Von Guggenberg. Besides Valspar Signature Interior Paint, which “stands up to anything”, as shown at the end of the spot, the Valspar range of Interior and Exterior Paint also includes Valspar Reserve Interior Paint, described as One-Coat Perfection, Valspar Ultra Interior Paint, which is “everyday washable”, Valspar Ultra 2000 Interior Paint, which provides “better coverage in less time”, Valspar Reserve Exterior Paint, which ensures “one-coat perfection for any weather”, Valspar Duramax Exterior Paint, with offers “maximum weather protection”, Valspar SeasonPlus Exterior Paint, ensuring “complete color defense”, and Valspar StormCoat Exterior Paint, of “professional quality”. The brand also provides concrete stains & sealers and porch, floor & patio paint. On June 1, 2017, The Sherwin-Williams Company, a global leader in the manufacture, development, distribution, and sale of paints, coatings and related products to professional, industrial, commercial, and retail customers, announced it has completed its acquisition of The Valspar Corporation.